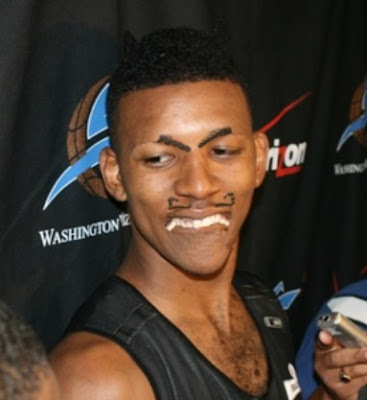 According to Flip Saunders, Nick Young smiles too much. It is obviously keeping him away from his full basketball potential. So how does Nick stop something that he has been doing his whole life...stop something that is just second nature? Easy. Shave off his eyebrows, glue on some Groucho Marx eyebrows slanting down. It will make anyone look meaner, despite what the mouth is doing. Draw on a fake devil mustache with a sharpie. The doodler devil mustache is very creepy. Combined with the eyebrows and you've got a mean dude. Glue his bottom lip to the back of his front teeth. Go look in the mirror, bite down on your bottom lips and smile. Creepy? Scary? At least its not a big smile. It causes the corners of your mouth to slant down more.